As the guest journey continues to evolve in terms of touchpoints and expectations, hoteliers are expected to adapt and curate a unique and continuously guest-centric experience. While the defining factors of an ideal guest experience may vary based on whom you ask, there are a few indisputable realizations, one of which is this: Hotels must offer a frictionless guest experience, and much of that experience is rooted in mobile. Ready to launch your Mobile Guest Journey? In this video, you´ll get a quick glance of how the Zaplox solutions help your guests to book their stay, find the reservation, check in, open the room with a mobile key, view in-time promotions and check out and pay their stay - all in their smartphone. Serve Your Guest in Every Step of their Journey. Zaplox infographic lists the most vital parts of a Mobile Guest Journey. Want to know how you can offer a mobile guest journey to your guests? For most people, travel, whether in the form of a vacation, business or a mix of business and pleasure, is an opportunity to escape from ordinary. Today’s demanding guest doesn’t just expect easy check-in, clean rooms, and a picturesque property. To improve guest satisfaction, you need to make sure each touchpoint leads to a great visit, and that the journey as a whole delivers on guests’ expectations. How does a hotel stay at the forefront of the movement? How can a hotelier capitalize on this evolution to maximize their offerings and subsequent revenue model? More than anything, how can you continuously put your hotel at the forefront of innovation with ideas that can make you stand out from the competition and keep guests coming back? Here are 4 answers to guide you in your work; Think Outside the Box, Offer Memorable Experiences, Leverage Social Media and Mobile Everything. 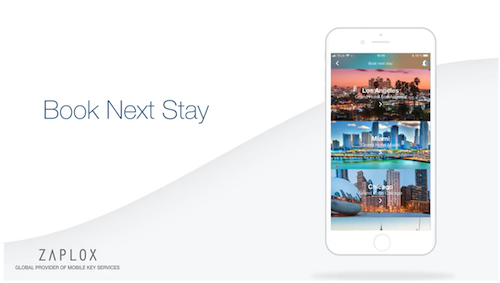 How well are hotels meeting guest expectations for mobile experiences? Guest expectations are higher than ever—and they are demanding to use their smartphone to check-in, open their hotel rooms, checkout and make purchases. Zaplox Infographics reveal insights that can shed light on the key mobile experience gaps that hotels need to address. Let's face it; plastic room keys are frequently tossed into handbags, pockets or briefcases without a second thought and, as a result, they are easily lost. How many times have you found yourself down by the pool while on vacation, or out for a meal, only to frantically dig around your belongings searching for a missing room key? Mobile key technology remedies this issue, as our mobile devices are one of our most important travel (and day-to-day) accessories. Often acting as a primary tool for communication, entertainment, social media, GPS and now, our hotel room key, it's easy to assume that guests will be far less likely to misplace their smartphone. There is a wide selection of mobile key applications available to today's hotelier looking to stay competitive. So, the question becomes, how do you determine which one is right for your hotel? Here´s three important components to focus on; Integration is Key, Perfect the Basics and Is it Future-Friendly?